Lewis Hamilton extended his drivers championship lead to 24 points with a well deserved victory over bitter rival Nico Rosberg, who started on pole but couldn't stand the pace of the flying Brit. Rosberg, starting on pole, could not withstand the roar pace of Hamilton and when the former world champion catapulted into the lead, there was absolutely no stopping him. The sun was beaming down in Texas, fans were rocking in the grand-stands, pumped for a pivotal race in the battle for the drivers championship. Light out, and away they went: Rosberg made a tremendous start, as did Hamilton but it was the German who went through the first corner holding onto the lead. Behind the flying Merc's, Felipe Massa leaped past his Williams team-mate into third after the Brazilian's quick start and sharp corner speed going into turn one. However, thins took a turn for the worst down the pack. Sloppy driving from Sergio Perez saw the Mexican clumsily collide into the side of Adrian Sutil, leaving both cars in bits. Perez was able to drive back into the pit lane but it was game over. Well, for the German, he was forced to park his car on the edge of the circuit. Thanks to that, the safety car came out and bunched the pack back together even more. Lap 4, and the safety car was needed no further. The cars went racing again, which saw Daniel Ricciardo make a terrific move on Alonso. The Australian activated the DRS system and scorched the former world champion past the main straight, down into turn one. Ricciardo back into fifth with that delicious overtake. At Lap 13, Hamilton was catching Rosberg with only 0.4 seconds separating he two team-mates. Rosberg managed to scrape a second lead over Hamilton but the 2008 world champion soon caught back up, launched his front end inside of Rosberg's car and got the over-take which catapulted the Brit into the lead. Shortly after that, Romain Grosjean displayed a slick piece of driving to glide past Vettel in the 4/5/6 corners where the world champion also lost another place to Ricciardo. Vettel desperately needed to pit. Ricciardo flew up into third place, which caused concern for the Mercedes team who ordered both of their drivers to pit. Hamilton and Rosberg pitted, while the German came out a lap after Hamilton did, he wasn't able to gain any time on his in-lap beforehand. 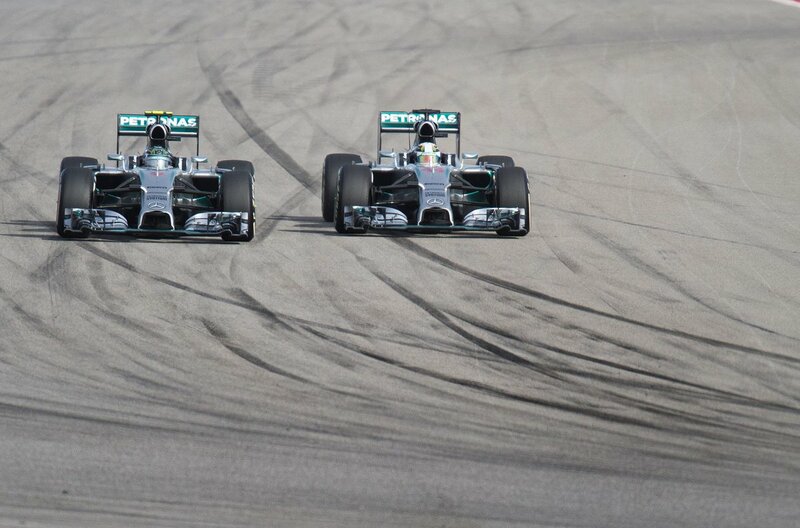 Therefore, Hamilton, on his out-lap retook the lead going into the fist corner. On Lap 46, Vettel attacked Magnussen, still on the worn out tyres. On the other hand, Button took the fight to Grosjean. Vergne made a move on Grosjean but it ended in misery for the Frenchman. While the Toro Rosso driver cut inside of Grosjean, they collided which left Lotus' man left behind Vergne. Up front, Hamilton comfortably lead Rosberg by a margin too much for the German to close down with just a few laps remaining at this point. Hamilton was a alp away from glory but was told to be careful while lapping the midfield because Button and co. were involved in a spicy scrap. He listened to his race engineer, and crossed the line to WIN the American GP! A fantastic, cool-headed drive from the Brit which extended his lead over Rosberg in the drivers championship to 26 points. "Get in there Lewis, epic drive! ", said Mercedes team engineers over the radio. Despair for Rosberg, who took to the radio and said: "Sorry guys, didn't work out." His title chances are all but over. Hamilton after the race: "It's such a privilege to be representing my country and be at the top of the driver wins is quite special. The car was great today." Nico Rosberg now faces an uphill battle after falling behind Hamilton in the title race even more - but with double points in the final race at Abu Dhabi - anything can happen.